Compared the slow tank-like progress of the BBS Documentary, GET LAMP is like a shopping cart aimed backwards going down a hill. On fire. The schedule is heavily bumped up, and since I’ve been through this process before, I have a much better awareness of limits and needs and the rest. As a result, I’ve already been getting in soundtrack music. I’ve been communicating with other music artists to bring songs into the project. I’ve been in contact with the cover artist. I’m beginning discussions with my duplicator. And I’ve begun filleting. Fiction films have the advantage of a general idea of what’s being aimed for, what script/context is at the other end. Granted, you can have an unexpected event change everything, or an incompetent director, or a mid-production script change, but even then, you replace a set of scripted events with another set of scripted events and keep shooting. The goal is to have it look and sound good, be enjoyable to watch, and fit in with the rest of what you’re shooting. So you generally shoot 2-3 times the footage you intend to end up with. More, of course, if you’re a perfectionist director and want something just right. But still, it all comes down to: you are working toward a set script. Nonfiction or documentary filmmaking can be split down further: you have scripted non-fiction and unscripted non-fiction. In scripted non-fiction, you again have a script, even though everything’s coming from truth this time and not somebody’s fantasy or made-up story. You then gather photos, audio, and artifacts to shoot footage from, and then anything you can’t find that kicks into your script is either brought in with interviews or shot as a recreation, which fits all the puzzle pieces into place. The ratio of shot footage to final footage is again relatively small, since you know exactly what you want, and when you go to people to conduct interviews, you hit them up with 5-10 questions of a specific nature and include what they give you. But then you get to the stuff like I did before and am doing again, where you basically sit down with people and talk to them on-camera and get “the story” as you go. At the end you have a pile of footage and then cull it into something else, where the final work is something you didn’t really know you’d have at the beginning of the production. This approach is comparitively expensive because of the insane ratio: I shot 250 hours of footage, resulting in roughly 5 hours of used footage. That’s a 50-1 ratio. And I’m just on the low end: some documentary filmmakers will do 100-200 hours for each hour they end up with. A contemporary example of this is the movie Hoop Dreams, which followed two boys for five years, amassed 250 hours of footage and got cut down to around 3 hours. (They shot on Beta videotape, by the way). That’s a lot of time with little variety in the shooting; I at least got to travel a lot and meet different people every time. So somewhere in there, you have to take the hundreds of hours of footage and knock it down into editable pieces, properly marked off, that you’re going to try and piece together into a narrative. That’s where you have to go through a process that I call “the fillet”, although I’ve seen it called logging or clipping, and probably a dozen other names. Here’s how this works. This is the user interface to my editing software. From there, you listen to an interview, and when the person makes a statement, shows some emotion, reacts, or otherwise does anything that might potentially go into your documentary, you cut out that clip. I happen to do all this wrong: I clip out the entire answer, and render it into a new clip in a lossless fashion (i.e. I don’t “re-render” it, adding needless compression or introducing extra artifacts). I name this clip in a highly descriptive manner, like this one I just did: “Moriarty – KEEPER – The period of success for Infocom was very brief”. This tells me it’s from the Brian Moriarty interview, that he talks about the success of infocom, but also does so cutting it down to just a few peak years. I then put all these cuts into a folder set, where this would go into a further sub-folder called “Infocom”. That way, if I need to pull “Infocom” stuff, I go in there and there’s a set of clips from people talking about Infocom. Does this sound boring? It can be. I literally have to listen to every interview I did at least once again, and occasionally multiple times, carefully pulling and marking away every possibly relevant clip. But the result of this hard work is evident in the final film: everything seems to weave together. 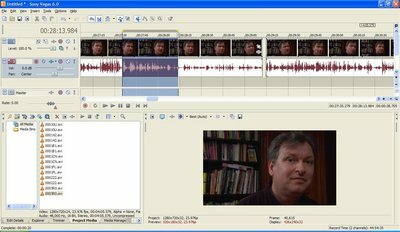 I’m able to pull together commentary from many different interviews over years and people almost complete each other’s sentences. The amount of clips any one interview yields varies greatly. In BBS Documentary, I’d have one hour interviews that resulted in one used sentence.. Others went on for an hour and I used 10 or 20 minutes of that hour in the final works. Obviously, I can’t predict how it’ll go this time, but I am finding a pretty high ratio of “usable” clips to choose from, so it’s going well. This is what I have to work on during days I’m not filming folks. I’m creating a library of thoughts and concepts, the bricks that I will eventually use to build my little house of documentary before inviting others inside. It’s definitely not for everyone, but it’s a necessary step if you wish to reveal the narrative buried in a hundred interviews. The high definition codec I’m recording in requires 4 gigabytes for every 10 minutes. I have recorded 35 hours of footage. How many shares in Seagate should you buy? Before I got to the end of your post I was thinking, “good God, how much drive space does this guy have?” Using your own formula, at 400 meg (or .4 gig) per minute, that means the BBS Documentary (at 250 hours of recorded video) you had 6 terabytes of video stored somewhere. Do you keep all the source material on tapes, on disk somehow, or what? Knowing you I know you still have that footage around. How many hours of footage do you plan on recording for Lamp, as compared to BBS? This actually assumes that the BBS Documentary footage takes the same size as the Get Lamp footage, which it doesn’t. BBS was shot using Mini-DV, which works out to 12gb an hour, or roughly half the size. I actually would transfer a tape, fillet it, then remove the full capture. So that’s how I saved space then. I’m doing something vaguely similar here, sort of. Yes, I have a lot of disk space, regardless. I’m expecting 150 hours of footage, HD style. Is there no way to simply bookmark portions of video instead of cutting them out and taking up more space? By that I mean, simply marking that between 03:13:03 and 04:01:40 Moriarty said this or that and being able to skip to that “bookmark” within the film immediately… Or even then, just writing it down instead of saving and naming files? That way, you can just go over your notes to see that you have 17 pieces of Infocom quotes that are good, and THEN cut out the ones that you plan to actually use….? Can’t wait for GET LAMP and others in the future! I’ll be there with a pre-order just like before, considering it was well worth the money and wait. I’m interested in this bit. Two questions: Why aren’t you just saving a list of timecodes? And how do you re-render losslessly (is your chosen codec all I frames)? Like I mentioned in the article, “I happen to do all this wrong”. Keeping it all around on a bunch of disks is a no go; not to ruin the suspense, but at my current estimate, 24gb x 150 hours = 3,600 gigabytes, or 3.6 terabytes. But any footage I am working on must be in three places for safety. Once something is locked as stuff I might use, I keep it live in three places, so if I kept that rule and even stuck to just the DVD-ROM backups I do, it would still be 10.8 terabytes for the raw footage; too much for me. Now, both of you are asking essentially the same thing: ‘Why not use subclips’. Kris takes it further and asks ‘Why not use reference clips’, but the same idea is in them. Be mindful that Trixter asks me this question often, occasionally frothing at the mouth, and everyone’s got a good case for it, but the fact is that I like the ability to go to full resolution at any time and make decisions, and I prefer to do some of my editing in the filesystem, i.e. sorting stuff into folders that are readable not just by vegas. All footage is saved in at least a hard drive and two DVD-ROMs. Hey. [wave] I did NOT come from Digg, I thought the anti-hotlinking prank was cool, and I have a suggestion for your documentary. I used to work the Computer Game Developers Conference and I tried hard to get to actually see at least one panel every year, usually something with Chris Crawford just because he was wonderfully entertaining no matter what he was speaking about. of us who worked in text games, which I did at the time. If you could get him to interview with you, I’m sure he’d have something insightful and entertaining to say, just because he always does.